I absolutely loved, loved, loved the last Kendra book, Mirrored (reviewed here). This one is written more of the style of Bewitched with multiple story arcs based on different fairy tales. How did it stack up? THE PLOT: The overarching plot is that Kendra met her true love, James, a wizard, back during the Salem witch trials. James helped save Kendra, but the two were separated. Even though they vowed to wait for each other, centuries go by as they occasionally re-connect only to separate again. 1. Little Red Riding Hood/Salem Witch Trials/ Ann Putnam. Lonely Ann is befriended by a talking wolf, and when Kendra spots the two of them together, Ann accuses Kendra of witchcraft before Kendra can accuse her. 2. Rumplestiltskin/ Bavaria, 1812/Cornelia. Cornelia meets handsome Karl at Kendra’s bookstall. Kendra’s assistant is also interested in Cornelia, and probably a much better match, but Cornelia is swept away by the romantic Karl. When Cornelia finds out the truth about Karl and realizes she’s in very big trouble, it’s Kendra’s magic and assistant to the rescue. 3. Cupid and Psyche/London, WWII/Grace (Okay, the ad copy says this is based on the fairy tale East of the Sun and West of the Moon, but I had never heard of that and recognized it as the myth of Cupid and Psyche). When Grace’s brother is reported missing in action, Kendra offers to help find him if Grace will marry cursed Phillip. Of course, Grace cannot see Phillip’s face, and can’t look at him even after they’re married. Grace takes the bargain but is ultimately goaded into breaking her word by her jealous sisters. Now she’s on a quest to get her husband back. 4. The Ugly Duckling/Modern-day Miami/Christopher. Chris and Amanda were best friends throughout childhood, both outcasts of sorts…Amanda an athletic tomboy whose mother was in jail, and Chris a weakling with an absentee father. But will their friendship survive when Kendra’s magic makes Chris a high-school swan? MY TWO CENTS: It’s a little difficult to compare a book with multiple story arcs to a book like Mirrored, which really only had one story, or two halves of one story. On the whole, I don’t feel like we got a lot more development of Kendra herself in this book, while I enjoyed each of the four sub-stories to varying degrees. I definitely liked the middle two stories better than the first and last. The first story I felt was a bit confusing and maybe unfinished; I half-expected Ann Putnam or her wolf to show up again in one of the later stories. My least favorite was the last, most modern story. I feel like Kendra was all but unnecessary in this story, and the childhood/teenage angst of Chris and Amanda was drawn out way too long. Plus, it didn’t help that Chris became a jerk. The middle two stories were delightful, though. I think the Rumpelstiltskin story was probably my favorite, although the WWII story about Grace was also intriguing. The heroines of both stories act foolishly and bring at least part of their troubles on themselves, as is the way of good fairy tales. Cornelia is blinded with the idea of romance and can’t see Karl’s true nature, nor that of the one who really does care about her. Grace is perfectly happy in her arrangement until she lets her sisters goad her into breaking the rules. Thankfully, both of them are able to learn from their mistakes. COVER NOTES: While this cover matches the style of the other Kendra books, it’s a little dark and murky for my taste. I like the elements of the mirror, straw, and crow; it’s just the colors I don’t like. I like that the title font matches that of the other books (I like when series books look they belong together). 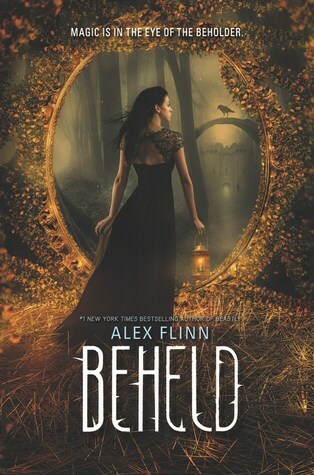 BOTTOM LINE: I didn’t love it the way I did Mirrored, but definitely still a must-read for any Alex Flinn/Kendra fans. TEACUP RATING: Three-and-a-half to four out of five teacups. ON SALE DATE: Available now in hardcover and eformats.